“As 2009 has drawn to a close, we thought it apropos to recap what a busy year we had and to provide a preview of 2010. 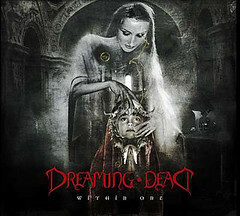 “2009 will go down in history as the year DREAMING DEAD began. Our debut album Within One was released in January 2009 and we’ve spent the last 12 months supporting it locally and nationally. Summer saw us supporting the album across the nation with two legendary metal acts: MASTER, GOREAPHOBIA and MONSTROSITY. It was our distinct pleasure to share the stage with these old school titans of the extreme, and we wish them the best until we meet again. “Since returning from our summer tours, we have been hard at work writing the follow up to Within One. The music has been coming together very naturally, and we can’t wait to drop your jaws with the new material in 2010. We currently have 4 songs completed, with probably 4 more to come and will support this with our first music video! We’d also like to announce soon we will diligently begin shopping for a label to permanently sign to. So tell your buddy with the trust fund to sign us and release the record. “We have also been hard at work this fall in preparation for our winter tour with NILE, IMMOLATION, KRISIUN & ABIGAIL WILLIAMS. *Yes!!!!! * Not only have we been honing our chops to hold a candle to these heavyweights, but we have been training up a new member of the DREAMING DEAD road team. Her name is Laura Christine, and you might know her from her work with WARFACE and MELDRUM. We’ve been jamming with her for a couple months now, things are sounding better than ever, and we can’t wait to unleash the fury on your unsuspecting ears. “Please come and see us play on the NILE tour! We’ll be playing a combination of old and new material, and it’s gonna be cold so we can use all the body heat you can bring. So come out early, we’ll be opening the shows around 6:30 every night. “Keep track of our adventures in sleet and snow by checking us out on our MySpace, Facebook and by following our every move on Twitter! The album, which was co-produced by John Haddad (HIRAX, INTRONAUT, PHOBIA, ABYSMAL DAWN), was officially released today through Ibex Moon Records. A CD release party for Within One is scheduled to take place Sunday, January 25th at the Knitting Factory in Hollywood, California. Also appearing will be GIGAN, BOOK OF THE BLACK EARTH, PSYOPUS, and CATTLE DECAPITATION.